I couldn't resist continuing the season's yellow flower trend and sharing one more before summer ends! This bright beauty was blooming across the deck from the pink hibiscus plant I posted last week. That's a nice close up..I still think the word hibiscus is funny though heheh! I love yellow; it's so gorgeous. Thanks for hosting. Wow. That is one nice striking flower. I really like that yellow. another pretty one. I like the yellow, but the pink from last week is my favorite so far. a beautiful capture...I really like flower photography and this is a great close-up! So delicate, you can almost see through it. Yet another gorgeous flower photo! Love it. Fabulous close up. Happy #WW! 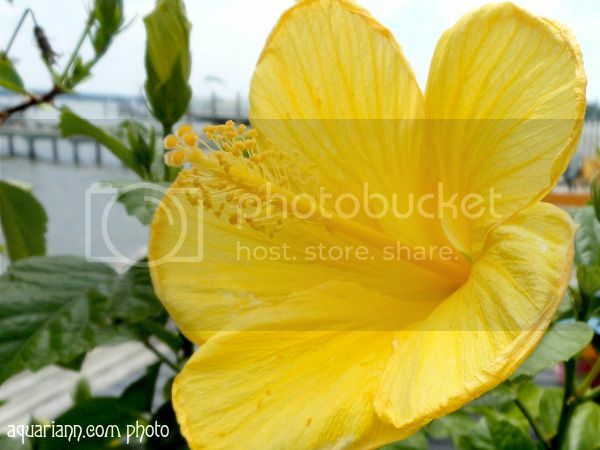 A beautiful flower and great composition! Such a beautiful flower, the color is so vibrant!! these are so beautiful. and I love the idea of pink and yellow together. That is such a pretty flower. Great close up! Love it! That is such a gorgeous bloom. I've generally only seen the Hibiscus in Red or White colors so this Yellow was a delightful surprise. I like the way the edges are curling and make it look thick and pretty! The blooms will be gone so soon. Nice to enjoy them now! Hibiscus, no matter which color, are such natural beauties! Nice capture. Very nice flower, beautiful color and so big!! Thanks for linking up this week, sorry took so long to get over.